赵京城, 杨涛, 付鑫如, 等. 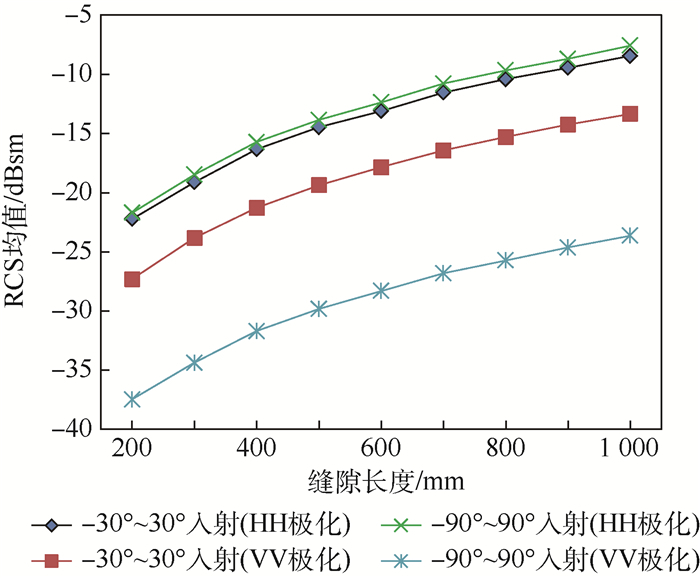 基于载体对消方法的缝隙小角域散射特性研究[J]. 北京航空航天大学学报, 2018, 44(7): 1554-1561. ZHAO J C, YANG T, FU X R, et al. Scattering characteristics of slit based on carrier cancellation method in small angular domain[J]. 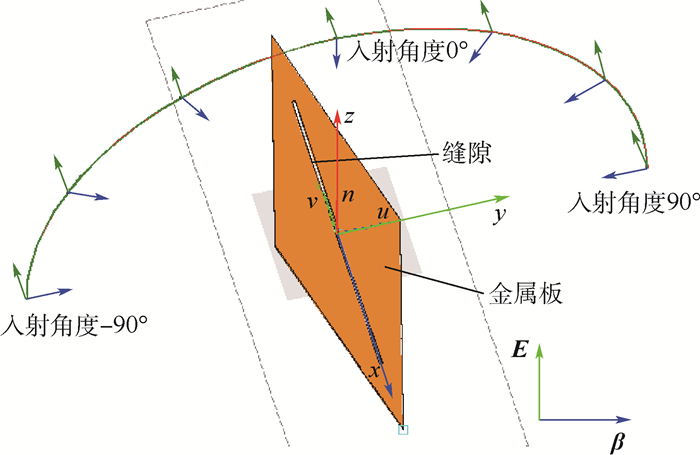 Journal of Beijing University of Aeronautics and Astronsutics, 2018, 44(7): 1554-1561. Abstract: An important part of the scattering of stealth aircraft is slit scattering. Though researches have done on it, none of them has produced results in small angular domain (from -30° to 30°). 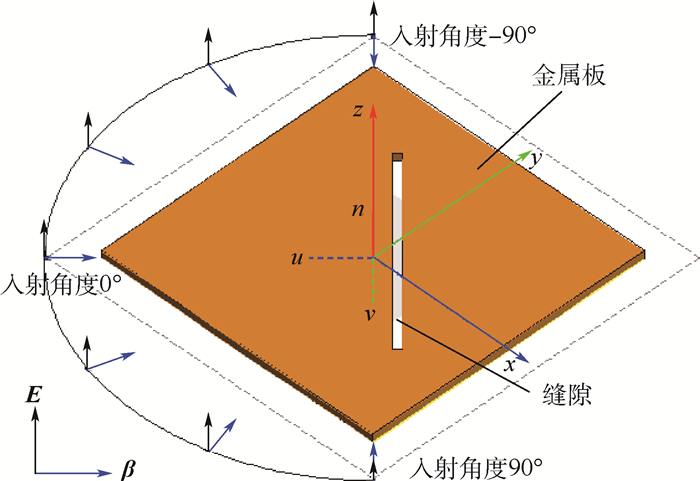 This paper applied the carrier scattering method based on superposition principle to electromagnetic scattering computation for more accurately studying the electromagnetic scattering characteristics of slit. 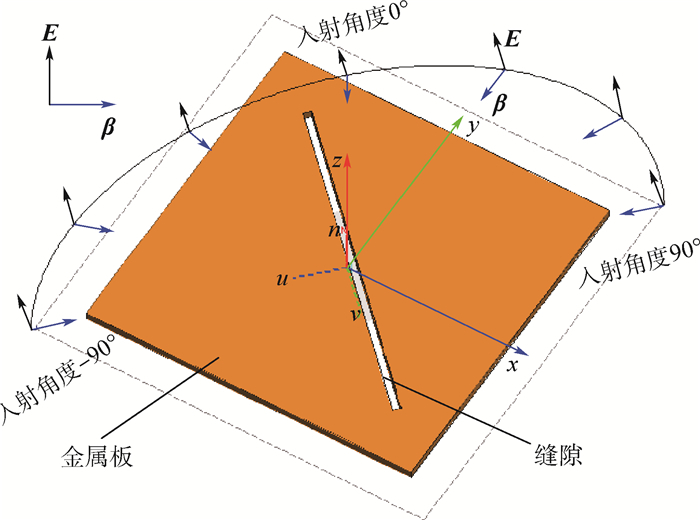 The effectiveness and accuracy of carrier cancellation method are verified by one-dimensional imaging of a plate with slit. 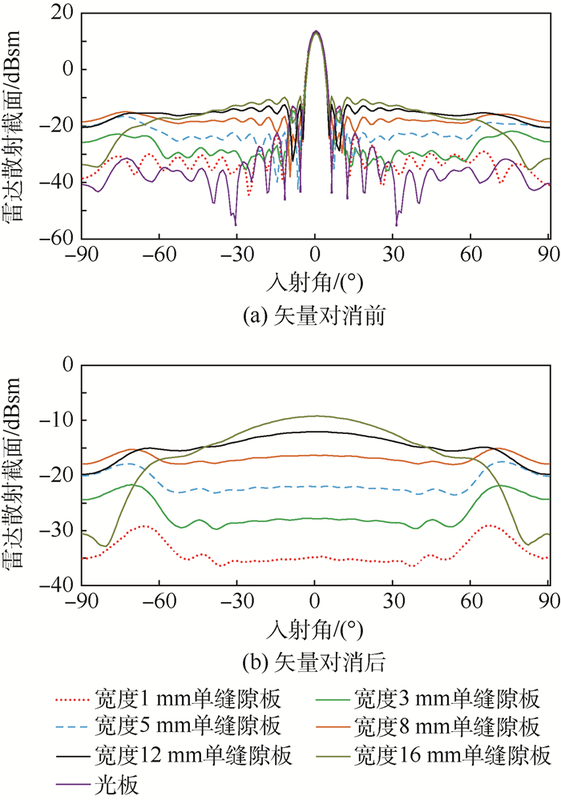 Statistics of polarization characteristics and variation pattern of slit scattering in small angular domain with the width and length were made at 10 GHz frequency. 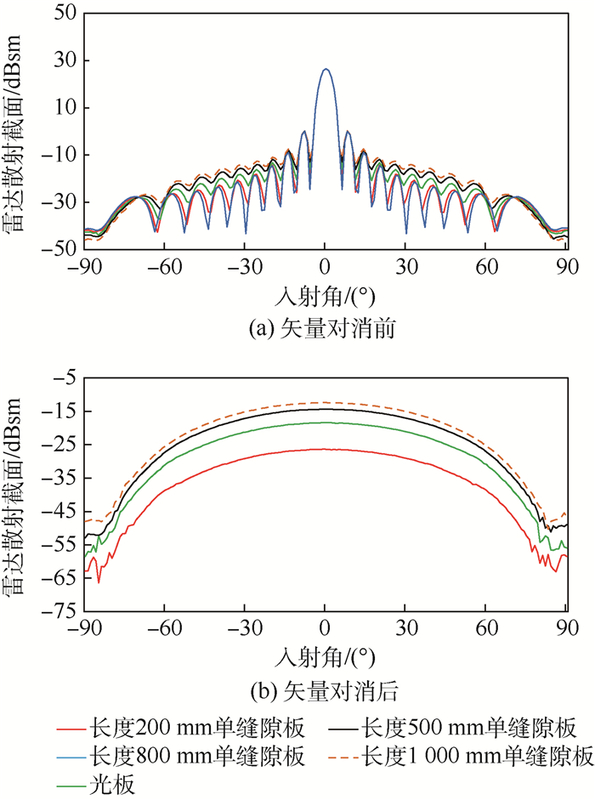 The study results with different slit width show that, in small angular domain, horizontal scattering is larger than vertical polarization scattering when the slit width is less than a quarter of wavelength; otherwise, horizontal scattering is smaller than vertical polarization scattering. 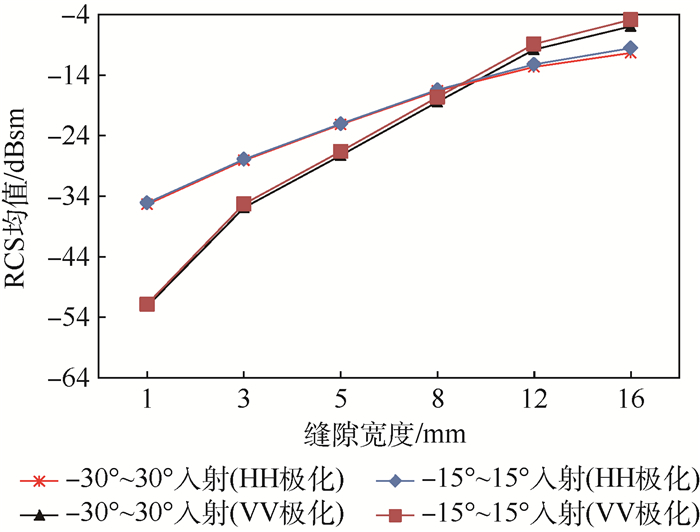 It is also found that the radar cross section (RCS) value of the slit increases faster with the growth of slit width under vertical polarization. The results with different slit length demonstrate that, in small angular domain, the mean value of electromagnetic scattering increases with the growth of slit length (200-1 000 mm) and the approximate range of scattering mean ranges from -22.2 dBsm to -8.4 dBsm in horizontal polarization and from -27.3 dBsm to -13.3 dBsm in vertical polarization. The relationship between RCS mean and slit length can be fitted to obtain RCS with a certain length, and thus the approximate range of RCS with different slit length could be calculated. 何国瑜, 卢才成, 洪家才, 等. 电磁散射的计算和测量[M]. 北京: 北京航空航天大学出版社, 2006: 19-20. 袁宁, 聂小春, 梁昌洪. 有限厚导电平板上任意缝隙的耦合特性分析[J]. 电波科学学报, 1999, 14	(3): 261–267. 朱劲松, 于洋, 王宝发. 飞行器结构缝隙电磁散射问题的研究[J]. 北京航空航天大学学报, 1999, 25	(1): 99–102. 柴建忠, 高旭, 刘学强, 等. 几种载体表面缝隙对雷达目标特性的影响[J]. 南京航空航天大学学报, 2014, 46	(4): 567–572. SENIOR T B A, SARABANDI K, NATZKE J R, et al. Scattering by a narrow gap[J]. IEEE Transactions on Antennas & Propagation, 1989, 38	(7): 1102–1110. SHENG X Q, YUANG K N, CHAN C H, et al. Scattering from a large body with cracks and cavities by the fast and accurate finite-element boundary-integral method[J]. IEEE Transactions On Antennas & Propagation, 2000, 48	(8): 1153–1160. DOMINEK A K, SHAMANSKY H T, WANG N, et al. Scattering from three-dimensional cracks[J]. IEEE Transactions on Antennas & Propagation, 1989, 37	(5): 586–591. PARK T J, KANG S H, EOM H J. TE scattering from a slit in a thick conducting screen:Revisited[J]. IEEE Transactions on Microwave Theory & Techniques, 1994, 42	(1): 895–899. 黄沛霖, 马冬立, 武哲. 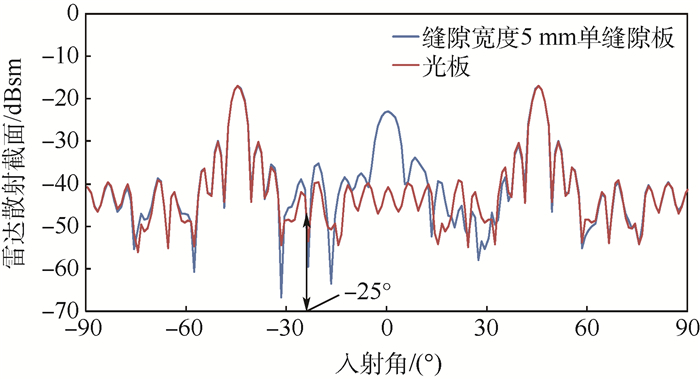 低RCS齿形挂架参数选择研究[J]. 北京航空航天大学学报, 2001, 27	(3): 293–296. 刘战合, 黄沛霖, 武哲. MLFMA分析表面不连续特征散射特性[J]. 合肥工业大学学报(自然科学版), 2009, 32	(9): 1430–1435. 黄沛霖, 刘战合. 飞行器表面缝隙电磁散射特性研究[J]. 航空学报, 2008, 29	(3): 675–680. 张振利, 倪维立. 缝隙及其与边缘的相互作用对目标散射的影响[J]. 电波科学学报, 2001, 16	(3): 301–305. 赵京城. 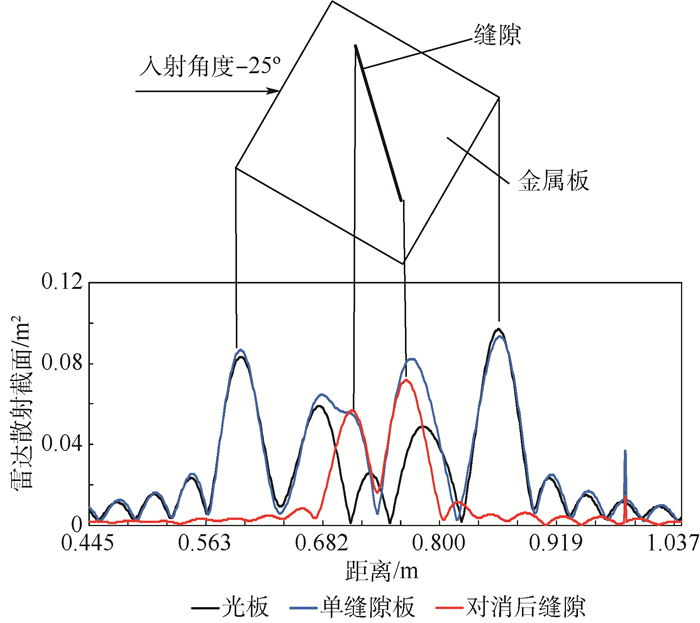 一种弱散射目标RCS测量方法: 201510760592. 1[P]. 2017-03-01. 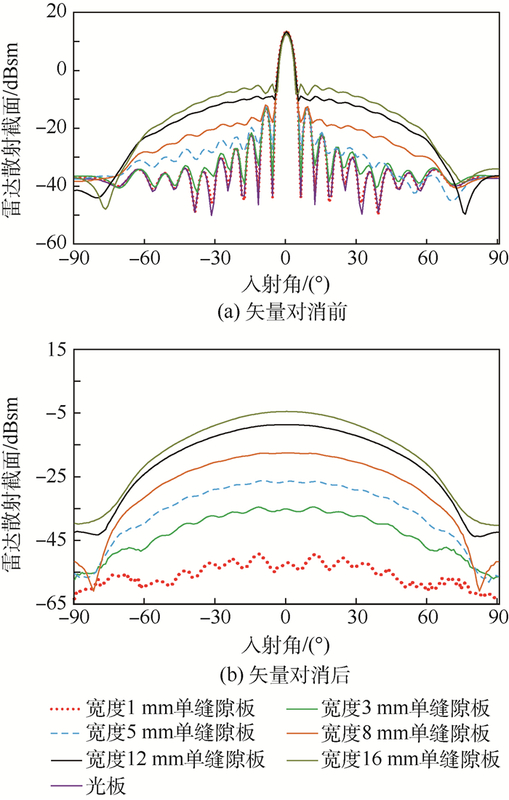 ZHAO J C. A kind of measurement method with weak scattering target RCS: 201510760592. 1[P]. 2017-03-01(in Chinese). 贾云峰. FEKO在雷达散射截面计算中的应用[J]. 中国制造业信息化, 2008	(2): 59–61. 吕杰, 莫锦军, 袁乃昌. 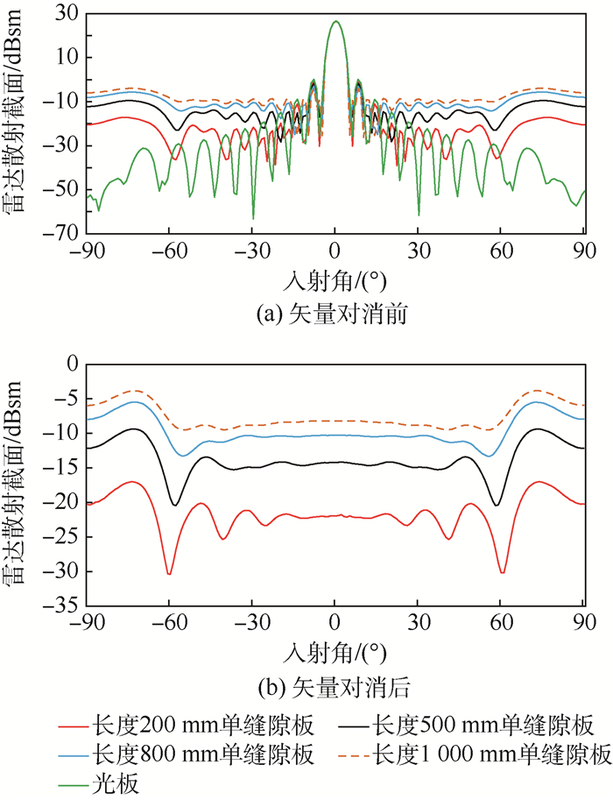 基于FEKO的微波成像研究[J]. 微波学报, 2010	(8): 598–600. 刘战合, 黄沛霖, 高旭, 等. MLFMA用于不连续特征多频散射特性研究[J]. 空军工程大学学报(自然科学版), 2009, 10	(2): 60–65. 刘战合, 蒋胜矩, 姬金祖, 等. 基于MLFMA的表面台阶多频散射特性[J]. 探测与控制学报, 2009, 31	(z1): 20–24. 高旭, 刘战合, 武哲. 缝隙目标电磁散射特性试验[J]. 航空学报, 2008, 29	(6): 1497–1501. 王湃, 董硕, 周永柱, 等. 多层快速多级子分析三维复杂目标的谐振区电磁散射特性[J]. 北京大学学报(自然科学版), 2006, 42	(3): 395–400. 桑建华, 张宗斌, 王烁. 低RCS飞行器表面弱散射源研究[J]. 航空工程进展, 2012, 3	(3): 257–262. 马风国, 高飞, 刘其中, 等. 流基混合法分析表面波散射[J]. 电波科学学报, 1994, 14	(2): 186–190.